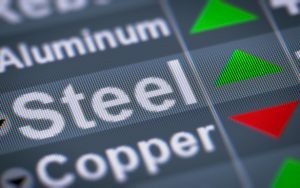 This morning in metals news, U.S. steel mills saw their shipments rise in June, Shanghai rebar steel prices hit a nearly seven-year high and copper recovers on optimism regarding U.S.-China trade talks. Shipments from U.S. steel mills rose 3.2% year over year in June, according to the Times of Northwest Indiana. In the year to date, U.S. steel shipments are up an estimated 3.6%, according to the report. According to Reuters, the Shanghai rebar steel price has surged to a near seven-year high. Supply concerns gave rebar price support. Rebar prices rose as much as 4.5% on Monday, according to Reuters. The copper price has plunged in recent months, but showed signs of bouncing back Monday, according to Reuters. The London copper price ticked up on positive sentiment vis-a-vis talks to resolve the simmering trade conflict between the U.S. and China. According to Reuters, LME copper jumped 0.9% Monday after closing down 0.2% Friday.